Origin and Habitat: Dioon mejiae occurs in the states of Colon, Olancho and Yoro of Honduras (mainland), and Nicaragua. The populations of Dioon mejiae have been conservatively estimated to total more than 600,000 wild plants. This includes two “super-populations”, each containing more than 100,000 plants. Altitude range: It grows at elevations of 265 - 500 metres. Habitat and Ecology: This species is typically an understorey component of semi-deciduous tropical rain forest and is found on steep slopes and in canyons, but also grows on flat terrain. Some populations thrive in sandy soil or sandy to clayey alluvial deposits, while others grow in loamy, limestone-derived soils; in decomposed granite rich in humus etc. The climate is subtropical, and rain falls generally in summer. Recent surveys in Honduras indicate that there are many large and healthy subpopulations with little evidence of decline despite use by local people. The major threat comes from habitat destruction as a result of the conversion of habitat to farmland and to a lesser extent the effects of logging and road-building on the habitat. 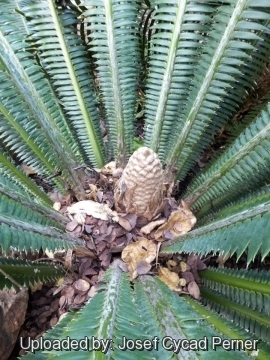 Description: Dioon mejiae is a small to medium, erect and usually unbranched cycad species mimicking the look of short palm trees. 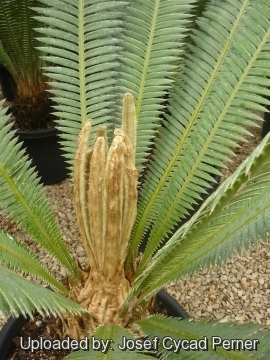 It is a very tropical looking Dioon that resembles Dioon spinulosum, though usually much shorter, or Dioon rzedowskii in appearance. It show well developed aerial stems growing in habitat up to 1 m in length over centuries. It is usually a vigorous grower that holds a number of leaves in the crown. 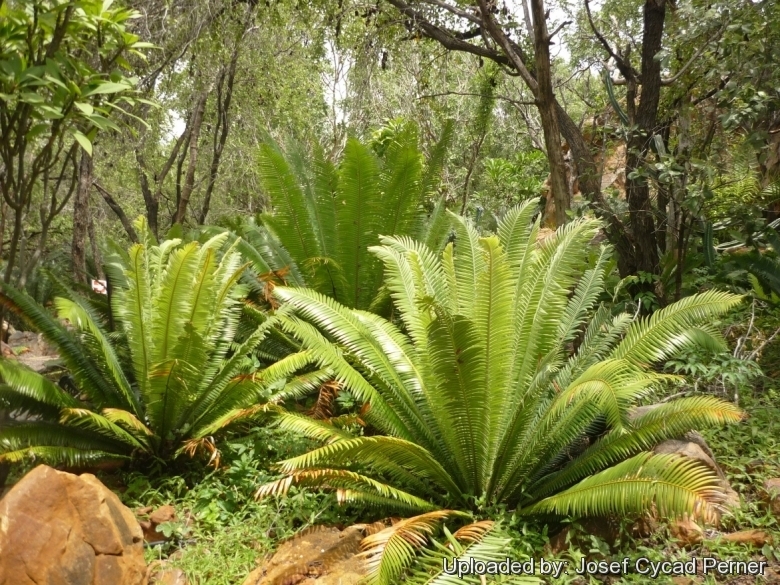 Primeval cycads like this Dioon mejiae are some of the oldest plants still living on the planet that trace their origins back to the ancient flora of the early Mesozoic era more than 170 million years ago. It is dioecious - it takes two plants to produce viable seeds. Distinguishing characteristics: The leaves are pale to dark green in colour, flat in profile (not keeled) in section, with spineless leaflets (except the terminal leaflet, which can be quite sharp), only the petioles are covered with thorns. Stem (caudex): Generally a single up to 1 m tall, 25 cm in diameter, slender, columnar, erect, clothed with petiole scars. 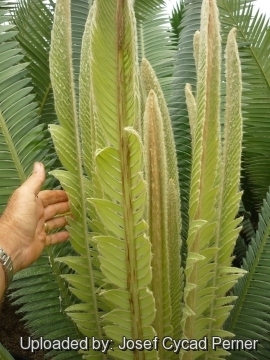 Crown: The fronds radiate out from the trunk and are obliquely erect. Leaves (fronds): Pinnate, stiff, to about 1-2 m long with 120-200 leaflets. In adult plants, the leaflets are flat, lanceolate, weakly discolorous, not falcate, median leaflets 12-22 cm long, 12-17 mm wide, light or bright green, highly glossy, not overlapping, evenly spaced and the edges of the leaflets are spineless; opposing leaflets inserted at 180° on rachis. The lower leaflets become smaller in size and are reduced to prickles on the petiole. In juvenile plants, the leaflets have spiny edges. 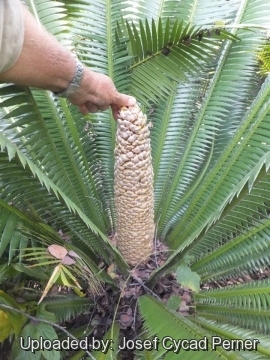 Male cones: Spindle shaped, pale brown, 30-80 cm long, 8-10 cm in diameter. 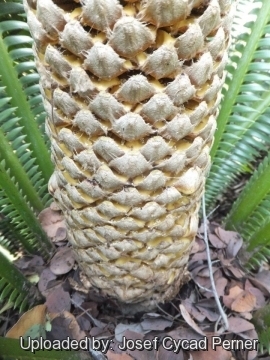 Female cones: Female plants produce very large pale brown, ovoidal cones on an elongated peduncle, reaching 30-50 cm long, 20-30 cm in width. Seeds: Oval shaped and approximately 40-50 mm long and 30-40 mm wide, sarcotesta cream to white. 1) Haynes, J. 2010. Dioon mejiae. The IUCN Red List of Threatened Species. Version 2014.3. <www.iucnredlist.org>. Downloaded on 20 November 2014. 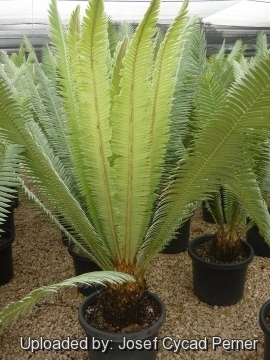 Cultivation and Propagation: Dioon mejiae is an adaptable plant well suited to tropical and subtropical climates. It is long lived and slow to moderately fast growing and a plant with 30 cm of stem can be quite old (10-20 or more years). However, in cultivation, a plant with decimetres of trunk is fairly old and considered a specimen. It is suited for sunny, well drained position. Makes a great specimen plant in a relatively moist warm garden. But it is eventually very drought resistant. Exposure: It thrives and grows best in partial shade. Waterings: In cultivation prefers moist soil with good drainage for optimal growth. Traditional uses: The Mexican genus Dioon all have edible seeds, with the most commonly consumed being Dioon edule Miq., Dioon spinulosum Dyer and Dioon mejiae Standley & L.O. Williams, the latter from Honduras is known as teocinte (not to be confused with teosinte, the ancestor of modern corn). The seeds have to be roasted, boiled or ground into meal for use in tortillas before consumption. The leaves (fronds) were used for decoration, especially in religious ceremonies. 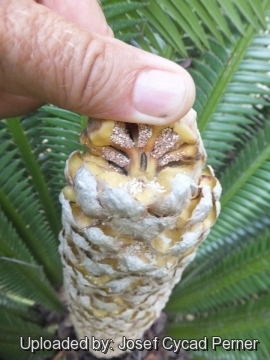 Warning: Cycad tissues contain a number of nasty compounds such as 0-methylaminpropionic acid (BMAA), macrozamin, and cycasin. In itself BMAA is quite harmless—after all, the plant does not want to kill itself—but if ingested by an animal it turns into lethal methylazoxymethanol (MAM). For instance, if a sheep eats an entire cycad leaf, the large dose of MAM, will cause almost immediate death due to liver failure. But if the poor sheep just nibbles on the plant, it will live for a few months while the malicious chemical spawns carcinogenic mutations in all major organs of the doomed mammal.... In Human BMAA is known to cause a wide array of neurodegenerative diseases, which often mimic Parkinson disease, multiple sclerosis, or dementia and also cause an extremely high incidence of liver cancer. Why do people still eat these dreadful plants? The answer is the same as if you asked why people continue to smoke—ignorance combined with the lack of immediate negative effects.... BMAA is a cumulative toxin, often taking years before it reaches levels high enough to cause such severe damage to the brain... Those cultures that still produce cycad flour or ferment cycad seeds rely on complicated rituals of multiple washes and peeling before declaring the product edible. 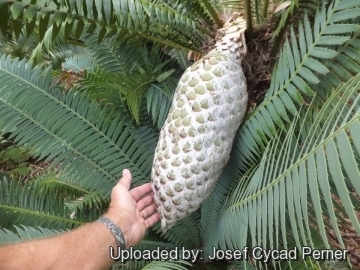 But residual amounts of BMAA are always present in the resulting dishes... Cycads are not dangerous as long as you keep them away from your digestive tract. And if your plant is happy enough in your garden to develop male cones, just try not to breathe in its pollen and you will be fine. [extract from: “Relics: Travels in Nature's Time Machine” University of Chicago Press, 31/Oct/2011]. The leaflets of dioon taper to a sharp point. It is well advised to plant virgin's palm away from footpaths and walkways. Wear heavy gloves when handling or working close to the plant to avoid getting jabbed by the sharp points of the leaflets. Propagation: This species may be propagated by seeds or by division and replanting of the attractive offsets or "pups" formed at the base of the oldest plant. They are among the easiest plants to germinate. The seeds are about a large grape size and hard as a rock.